An Engineering Graduate from IIT Kanpur with 46 years of Aviation Experience in Air Traffic Control, Obstacle Survey, Aeronautical Charts, Planning of Airports & Helipads, Airport Management. Working as Aviation Consultant. A huge Blue coloured ice block weighing about 8 to 10 Kg fell in a house in ‘Pakdaha’, under Sashan Police Station, Distt. ’24 Pargana’ (West Bengal), on 13th Oct 2016 (Thurs Day) at around 0730 Hrs. Indian Standard Time. After fall, the ice piece broke into pieces and started melting. A big crowd gathered to watch the incident and many people took photographs from their mobiles. The ice block melt after some time. Many people collected ice sample and the liquid from the molten ice. Suspecting the source from an aircraft, the officials from Geological Survey of India, collected the ice/ liquid samples for the purpose of getting them tested. The site of incident (Coordinates 22°40’55″N, 088°34’12″E) is located just 10 Kms East of Netaji Subhash Chandra International Airport, Kolkata. The Colour and other evidences confirm the source of ice from the leaking toilet lines of a commercial aircraft. An incident of District Harda (M.P. ), India on 04th April 2016. On 07th Jan 2016, the Times of India published a case of fall of ice from sky in a village in Dist Sagar (M.P.) India, (Geographical Coordinates 23°14’03.39″N, 78°53’06.08″E) that had occurred on 17th Dec 2015, resulting into injury to an old woman. Possibly the ice was from the leakage of liquids from toilets of defective pipe lines of an aircraft. Perhaps this is the first case in India where some one suffered personal injury due ice from sky. Times of India News Report ft 07-01-2016 is attached. Ice block weighing about 8 Kgs fell from sky. Eye witness stated that he was working in his field located near the road to Mirch Khedi, he heard a loud noise. On investigation,he found that a block of ice had fallen in his neighbour Narayan Kumhar’s house. After the fall, the ice had broken into pieces. Then many villagers reached at the spot. It was a matter of surprise and the news became the talk of the town. As per the news report appearing in “Praaja Kannada TV”, lumps of Blue Ice fell from sky on 13 Nov 2016 in Surappalli Village near Chikballapur Taluk, District Bagepalli (Karnataka), India). The YouTube Link in Kannada Language: https://www.youtube.com/watch?v=DVzhqwfCoBM shows interviews of eye-witnesses (Villagers) handling ice lumps of blue colour and storing molten liquid (blue coloured) in bottles. Geographical Coordinates of the incident site are 13°40’40.91″N, 77°54’25.57″E, and the place lies at a distance of 57 Kms on a bearing 022° Degrees (North north west) from Kempegowda Intl Airport (Bengaluru). This is a case of fall of ice from the toilets of an aircraft, which perhaps was coming to land at Bengaluru Airport from North. Such ice from aircraft gets formed when there is leakage of toilet fluid from the defective leaking sewage lines from the aircraft toilets. Large number of such cases of fall of ice from sky have been reported in India and in other countries. 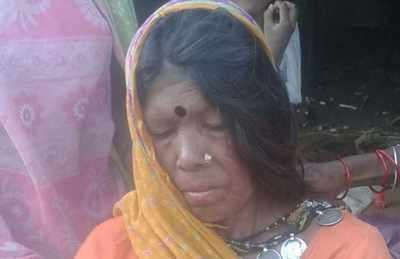 BHOPAL: Taking cognisance of TOI report, Madhya Pradesh Human Rights Commission (MPHRC) issued a notice to state government seeking report on an unusual incident wherein a 60-year-old tribal woman was injured after a football-sized chunk of ice fell on her from the sky in Sagar district. The Collector of Sagar has been asked to submit a report on the matter by human rights commission chairman and retired IPS officer V M Kanwar, said sources. What was touted as a rare celestial occurrence in district’s Aamkhoh village on December 17 had grabbed attention of aviation scientists who believe culprit was a commercial plane which dropped a ball of frozen poo and urine from its toilet. Experts say that was perhaps the first incident in India, where a person suffered injuries due to fall of ice from a passing plane and the victim was entitled to compensation for the injury. Eyewitnesses claim the victim, Rajrani Gaud, is alive only because the 50 kg ice chunk crashed into the terrace edge of her house before hitting her. While administrative officials in the state believe it’s a difficult case for investigation, Bimal Kumar Srivastava, Delhi-based independent aviation consultant, who has done extensive research on mysterious ice ball dropping from sky, has framed a line of investigation for Sagar incident and has shared with TOI. “This is something which should be investigated and documented. What if ice ball fell on her head? 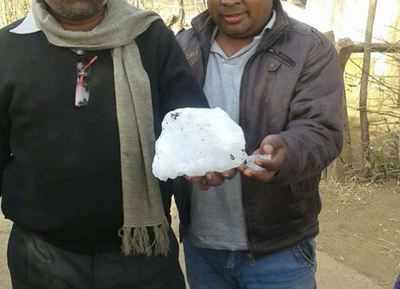 A 400 kg ice ball dropped from sky in Jashpur, Chhattisgarh, before the Sagar incident. Imagine the situation if it had fallen on a residential area. Who would be held accountable,” asked Srivastava. It could either be a ‘blue Ice’ – a term used in aviation context for frozen sewage material leaked mid-flight from aircraft’s toilet or a ‘megacryometeor’ – extremely large atmospheric ice conglomerations that fall under blue-sky atmospheric conditions. If it was a ‘Blue Ice’, the incident will be termed as ‘aircraft accident and victim is entitled to compensation under Aircraft (Investigation of Accidents and Incidents) Rules, 2012, said Srivastava. Then district collector A K Singh did not get the matter investigated considering it as rumour. “There is a strong possibility that ice block may have fallen from the toilet of some aircraft cruising on the flight route and injured the old woman,” said Srivastava, who has more than 45 years of aviation experience in field of air traffic control, aircraft accident investigation, airport planning, airport management and airport obstacle survey. He said incident was located at geographical coordinates 23°14’03.39″N, 78°53’06.08″E, which lies just below air traffic services route (ATS) of A-791 (Karachi-Kolkata-Bangkok), where the aircraft at height could be seen flying regularly from East to West or West to East when the sky was clear. “An aircraft cruising Eastwards over that route would take about 8 Minutes to arrive over Aamkhoh after crossing Bhopal, and aircraft flying West-wards would take about 11 Minutes to arrive over Aamkhoh after crossing Jabalpur. So it would not be that difficult to identfy the aircraft which passed over dropping the iceball,” he said. Delhi based aviation consultant B K Srivastava who had been monitoring these incidents for last 10 years firmly believes that a proper investigation into this drop with not only help the victim get a compensation but will also detect breach in aircraft’s laboratory system. Aamkhoh, the place is located at Geographical Coordinates 23°14’03.39″”N, 78°53’06.08″”E. Part of ATS Routes A-791 at this location falls under the jurisdiction of Nagpur/ Mumbai ATC, and there are two reporting points on ATS Route A-791 viz. Bhopal & Jabalpur. Aamkhoh is located exactly below that route at a distance of 160 Kms East of Bhopal and 121 Kms West of Jabalpur. A rough sketch on Google Earth shown below will substantiate the assumptions.